Braintree, MA (October 11, 2016) – Full-service real estate firm Peabody Properties, Inc. today announced that The Moorings at Squantum Gardens, 420 E. Squantum Street, received an award for Regional “Exemplary Development for the Elderly” through The New England Affordable Housing Management Association (NEAHMA) Community of Quality (COQ). This award-winning Community of Quality property overlooks both Wollaston Beach and the Boston city skyline and is located nearby charming Marina Bay. This picturesque collection of two-hundred twenty-three, one- and two-bedroom apartment homes also enjoys views of panoramic Quincy Bay. Designed for residents 55 and older, The Moorings at Squantum Gardens features two, four-story buildings offering elevator access, laundry care suite on each floor, vibrant resident community rooms, game/TV rooms and fireplace reading rooms. 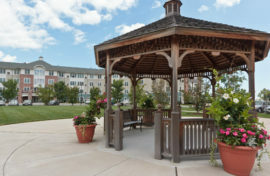 The Moorings boasts lushly manicured grounds, walking paths and a centrally-located gazebo. The on-site Resident Services Coordinator encourages resident participation in the many programs and activities offered, as well as individual supportive services. Just minutes from one’s front door, residents can enjoy the Marina’s Nantucket-style ambiance including restaurants, pharmacies, banks, and grocery stores, or just enjoy a leisurely stroll along the boardwalk. The Moorings at Squantum Gardens will now compete at the National level for the NAHMA Awards in March, 2017 in Washington, DC. Peabody Properties is proud to manage communities that are a revered as national models of housing excellence, coupled with such rich and vibrant resident services programs.